Cars age too, models that were once the most competitive in its segment soon begin to feel the pinch from its rivals. If the competitor has a better car, people tend to shift focus. To prevent this from happening manufacturers are quick to update their models. 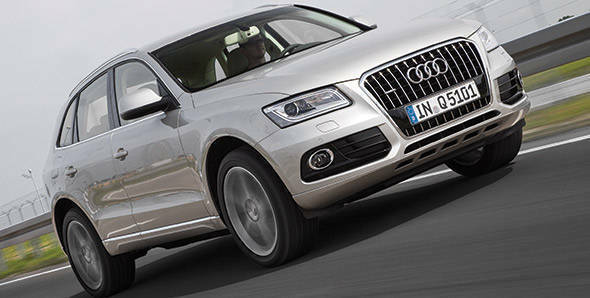 One such example is Audi and its the Q5 this time that has gone under the scalpel. The SUV has been around for a while now and is in its mid life phase, so it's obviously time for an update. We were in Germany earlier this year to test the entire range of Q5 models and more importantly focused on the variants that will make it to India this year. The Audi Q5 has always been a smart looking car, the combination of Audi's typical Q styling combined with a hint of car like detailing has made it appeal to a wider audience. However, the launch of newer Audi models made the Q5 look rather old. The 2013 model now receives a full facelift giving it the typical Audi family look. The front grille has been replaced with a newer style hexagonal grille and the all new headlamps are sharper and feature Audi's light scatter LED technology similar to most modern Audis. The LEDs outline all sides of the headlamp giving the Q5 a distinctive look. The redesigned front bumper goes well with the overall design and houses new fog lamps too. The sides are exactly the same as before and nothing much has changed. At the rear, the tail lights are of similar design but feature a different layout and LED light bands. The bumper too has been replaced with a smarter unit. Inside, the dash layout has been untouched but a few changes have been made to the interior. The user controls now have chrome detailing while the control stalks and instruments have been given subtle modifications. The MMI controls now have four buttons while the steering wheel features a newer Q specific design. There are more colour schemes including lighter hues but we don't think all colour options will be on offer in India. All engines in the Q5 range receive updates, India will mostly get three variants - the 2.0 TFSI petrol, 2.0TDI and 3.0 TDI diesels. All three engines now produce more power and are claimed to return better fuel efficiency. The 2.0 TFSI receives an updated fuel injection system, turbochager and integrates the exhaust manifold in the cylinder head. Audi claims that all of these changes translate to better performance. The engine now produces 225PS and 380Nm of torque (outgoing model produces 211PS of max power and 350Nm max torque), power delivery is impressive for a 2.0-litre engine while the 8-speed tiptropic automatic (there is no 7-speed S tronic option) offers quick and smooth gear shifts. Wide gear spreads mean the long gear ratios in the upper gears reduce fuel consumption, while the short gear ratios of the lower gears improve performance. The 2.0TDI (which is the most popular variant in India) now produces 177PS of max power and 380Nm of peak torque, up by 7PS and 30Nm respectively. This engine unlike the petrol unit will continue to be mated to the familiar 7-speed S tronic transmission. The dual clutch gearbox offers quicker shifts and better power delivery. The engine has always been refined and continues to be so. Driving on the Autobahn in Germany, the car effortlessly cruised at speeds above 170kmph. The engine is now more efficient, Audi claims an overall fuel efficiency of 16.66kmpl. The 3.0 TDI on the other hand is a powerhouse. The engine now produces a slightly higher 245PS of max power and a healthy 580Nm of peak torque (up by 80Nm). This enables the car to hit the ton in a claimed 6.5 seconds and max out at 225kmph. The fuel efficiency Audi claims is an impressive 15.6kmpl, more so considering the performance offered. The car gets the same 7-speed S tronic transmission as in the 2.0 TDI. In terms of handling, all variants feature standard all-wheel drive with torque vectoring. The Q5 goes confidently around corners and displays very little body roll, in fact it is more car like in terms of dynamics. The suspension setup is same as before but now features newer springs and shock absorbers resulting in better ride compared to the older model, especially over rough roads and broken patches. However, the steering is now a new electromechanical system. This makes the steering very light resulting in very little feedback especially at high speeds. Though the power assist adjusts to vehicle speed, the steering still feels lifeless. Considering the Q5 is an SUV, one expects better feel and weight to the steering. The benefits of this system though are that it doesn't consume any energy in straight line driving, resulting in reduced fuel consumption. The light steering is a boon while driving through crowded roads and parking in tight gaps. The new Q5 is expected to hit Indian roads by end of this year and will be slightly more expensive than the current models. Rivals better watch out since this Audi is coming your way with more armor.